This isn’t the first thing most of you will think of when you read that phrase. But this breakfast is the kind of old-country stick-to-your-ribs fare that my Armenian grandparents enjoyed. Now I make it for any time of day, and always relish it, especially during a winter like this, when you’re always fighiting the elements. I always think of this as the Armenian version of Chinese jook, or congee. Same principal: rice cooked well in plenty of liquid, with some protein add-ins. But jook can be put in a crockpot and cooked all night, whereas malez abour, at least in my family, is usually cooked no more than a half hour. 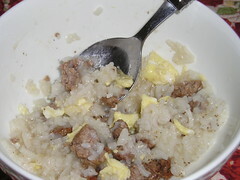 Cook rice in water until it is very soft, about 20-30 minutes. The mixture should be soupy. Add cooked lamb and scrambled eggs, and simmer a few more minutes, using the flour/water mixture to thicken, if necessary. Serve with plenty of freshly ground black pepper and salt to taste. Some versions suggest using a little flour mixed with water to thicken this if necessary, but I’ve never thought I needed to do that, the rice releases enough starch to thicken it plenty for me, and if anything I find myself thinning it down with more water near the end, and especially upon reheating leftovers. I like it! Super innovative. I’d try it if I had some lamb around! Hmm, maybe I should get some.